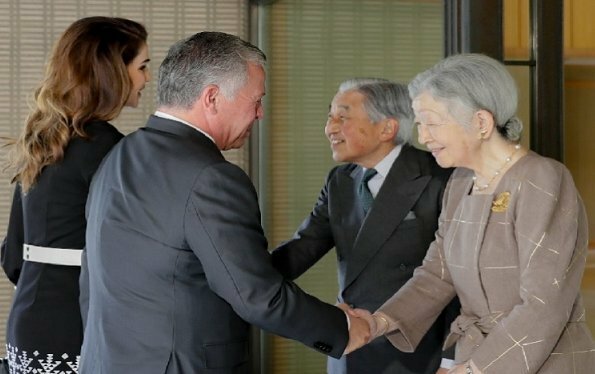 King Abdullah II and Queen Rania of Jordan are making an Official Working visit to Japan on November 25-28, as the guests of Japanese Prime Minister Shinzo Abe. 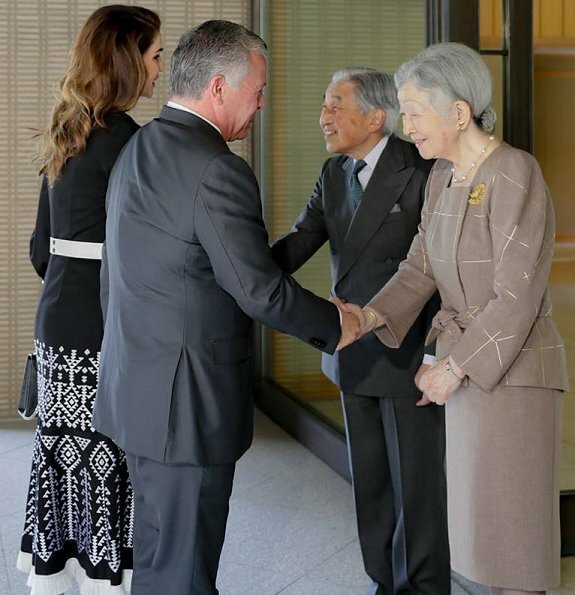 King Abdullah and Queen Rania arrived at Haneda airport in Tokyo on November 25, 2018. 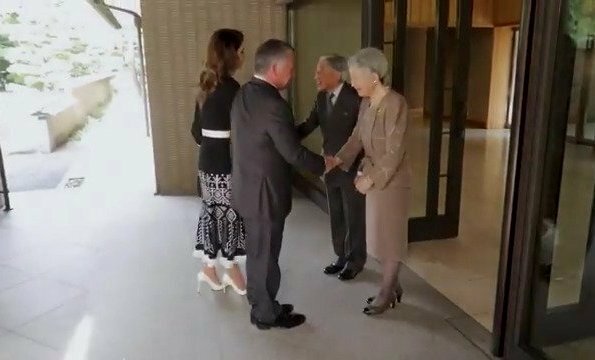 On November 26, The King and the Queen were welcomed by Emperor Akihito and Empress Michiko at Tokyo Imperial Palace. 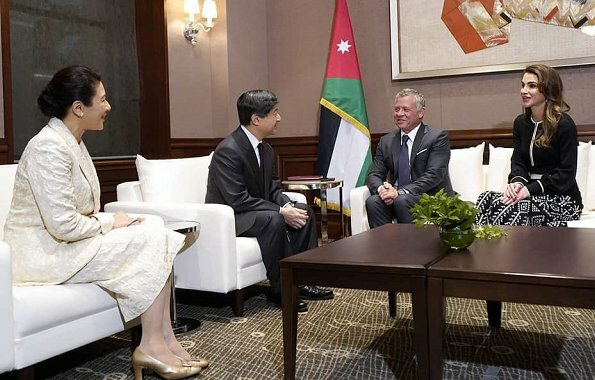 Afterwards, King Abdullah II and Queen Rania met with Crown Prince Naruhito and Crown Princess Masako of Japan. Rania's outfit looks beautiful, as does she. I love the traditional pattern/designs on the skirt. I'd have preferred black shoes instead of white, and perhaps a lower square heel. Fabulous look on Rania. Refrains from the too-high fashion. Great print. CP Masakomlooks lovely and appropriate and so does the ever elegant empress. Q Rania looks stunning today,from head to toe.The Empress always looks grand. Pss Masako's outfit today is a nice color but it look's a little big on her?. I love this skirt, wonderful! I agree with the comment that Rania should be wearing lower heeled shoes. 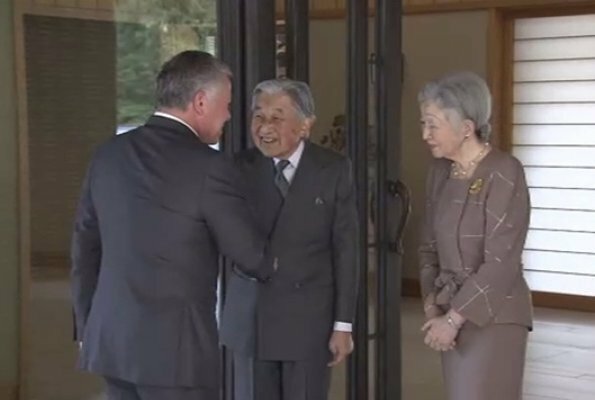 Why the need to tower over the tiny Japanese royals any more than necessary? Maxima, Mathilda, etc. all have worn these high stilettos while visiting Japan. I, too, think it would be more diplomatic to wear a lower heel but then I don’t like these shoes on any occasion. They are very bad for women’s health. Now, off the soapbox! They all look lovely.